Adelgunde “Gunta” Stölzl was one of the most successful women designers connected with the Bauhaus, the school founded in 1919 by the German architect Walter Gropius. The mission of the Bauhaus was to integrate art, design, and craft through a curriculum that involved training in specialized workshops. After encountering the school’s manifesto while studying at the Kunstgewerbeschule (School of Applied Arts) in Munich, Stölzl applied with a portfolio containing work she had produced both as a student and as a Red Cross nurse during World War I. She was immediately accepted into the Bauhaus with a scholarship and went on to play a crucial role in the development of the school’s weaving workshop. She became junior master in 1927 and full master the following year, making Stölzl the only woman at the Bauhaus to achieve the prestigious title. Her textiles were known for their abstract, asymmetrical compositions, complex patterns, innovative use of color, and experimentation with unconventional materials such as cellophane. 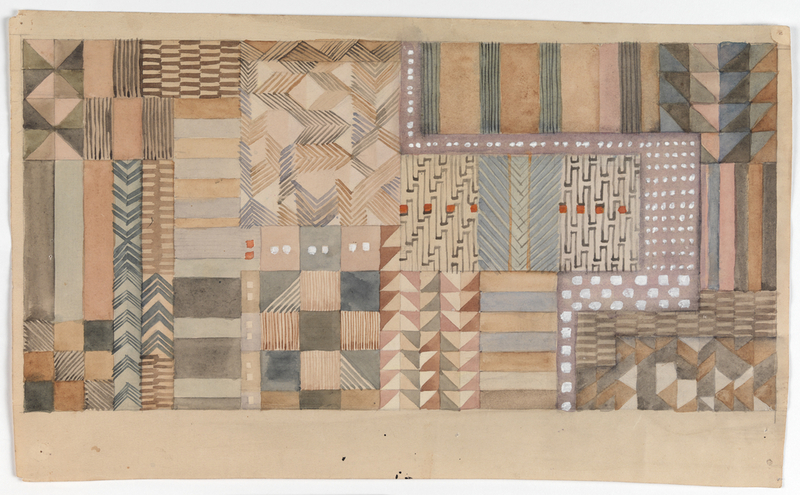 Stölzl’s sketches for Jacquard woven textiles include this design, which incorporates a variety of geometric patterns containing rectangles, squares, triangles, and chevrons. The design is rendered in a muted palette of sandy pink, beige, taupe, grey, and brown watercolors, with isolated dots and small squares in white gouache and red wash. The calm, subdued colors compete with a sense of forward movement and momentum created by the repeated arrow-like forms within the composition. Stölzl’s design demands the continual reorientation of the viewer, as the eye moves horizontally and vertically from one intriguing geometric pattern to the next. Still, the replication of interrelated shapes is reassuring, creating a sense of familiarity that resonates with the Jacquard technique, a process marked by its ability to produce unlimited reproductions. Carey Gibbons is a Cataloguer in the Drawings, Prints & Graphic Design Department at Cooper Hewitt, Smithsonian Design Museum. Monika Stadler and Yael Aloni, eds., Gunta Stölzl: Bauhaus Master (Ostfildern: Hatje Cantz and New York: The Museum of Modern Art, 2009), 86. Ingrid Radewalt quotes a letter that Stölzl wrote in 1977 to the Museen für Kunst und Kulturgeschichte der Hansestadt, Lübeck in “Jacquards,” in Stölzl, Meisterin am Bauhaus: Textilien, Textilentwürfe und freie Arbeiten, 1915–1983 (Ostfildern: Hatje Cantz and Dessau: Stiftung Bauhaus, 1997), 209. See also T’ai Smith, “Gunta Stölzl: 5 Choirs. 1928,” in Barry Bergdoll and Leah Dickerman, eds., Bauhaus 1919–1933: Workshops for Modernity (New York: The Museum of Modern Art, New York, 2009), 206–09.